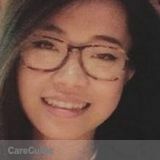 Want to connect with Mei? Hello! My name is Meiyu and I've just recently moved into Arlington. I am attending MVC this semester in hopes of pursuing my career in Pediatric Nursing. My current schedule this semester will allow me to be very flexible throughout the week and weekends. I am a devoted and reliable Babysitter with 3 years of Childcare experience as well as pet-sitting. I can offer an extensive amount of experience in all forms of Childcare, errands, and general housekeeping. I believe that a child deserves the best of care while also being a good mentor. Also, I have a passion for encouraging children to be themselves while allowing them to grow.